Whoa…profound Chey! I do my best to remind my mom she is better for adopting me…but she usually beats me to it. She tends to fuss. Our Bein is SO inept at helpin us into a harness to go outside! You are very lucky! Hmmm…..now that we got control of the remotes we need to enlighten them too??????? Chey, those are words to live by…we let our humans know what we want every chance we get!! You really are so WISE Chey. You know, our mom is quite serious when she says that she’s learned to live a life of service through us. Words of wisdom! Be caring and loving, but don’t let them forget who’s boss. And sometimes it takes a good bitey to teach them a lesson. If we had thumbs we’d use a sledgehammer. Good job Chey, putting that human on a leash and teaching them a few things. Cats rule as you know. Hope all of you have a great day. 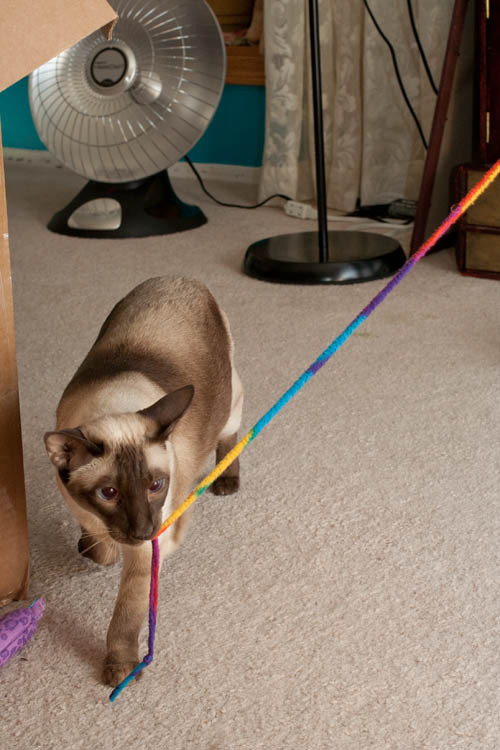 I need to get a leash for my Mommeh…. We’ve got the ‘leading our beans’ part going pretty well…….but the food reminders are a problem – could our beans be somewhat deaf? Truer words were never spoken Chey! Chey, you are so wise. Chey, I think you are leading everyone around by the leash! You know exactly who is in charge. Thanks for being the first commenter ever on the new blog for the future kittens!